I was recently reading an article on ReadWrite.com titled “IoT devices go forth and multiply, to increase 200% by 2021“, and while the article noted the benefit for consumers and the industry of this growth, two things in the article stuck with me. The first was the specific statement that read “researchers warned that the proliferation of IoT technology will create a new bevvy of challenges. Particularly troublesome will be IoT deployments at scale for both end-users and providers.” Not only was that sentence a mouthful, but it really addressed some of the challenges that can come building solutions and deployment of this exciting new technology area. The second sentiment in the article that stayed with me was that Security issues could grow. So the article got me thinking, how can we create these cool IoT solutions using low-cost efficient microcontrollers with a secure operating system that can easily connect to the cloud. Luckily the answer came to me by way of an exciting new open-source based offering coming from AWS that I am happy to announce to you all today. Let’s all welcome, Amazon FreeRTOS to the technology stage. Easily to create solutions for Low Power Connected Devices: provides a common operating system (OS) and libraries that make the development of common IoT capabilities easy for devices. For example; over-the-air (OTA) updates (coming soon) and device configuration. 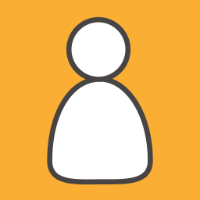 Secure Data and Device Connections: devices only run trusted software using the Code Signing service, Amazon FreeRTOS provides a secure connection to the AWS using TLS, as well as, the ability to securely store keys and sensitive data on the device. Extensive Ecosystem: contains an extensive hardware and technology ecosystem that allows you to choose a variety of qualified chipsets, including Texas Instruments, Microchip, NXP Semiconductors, and STMicroelectronics. Cloud or Local Connections: Devices can connect directly to the AWS Cloud or via AWS Greengrass. What’s cool is that it is easy to get started. 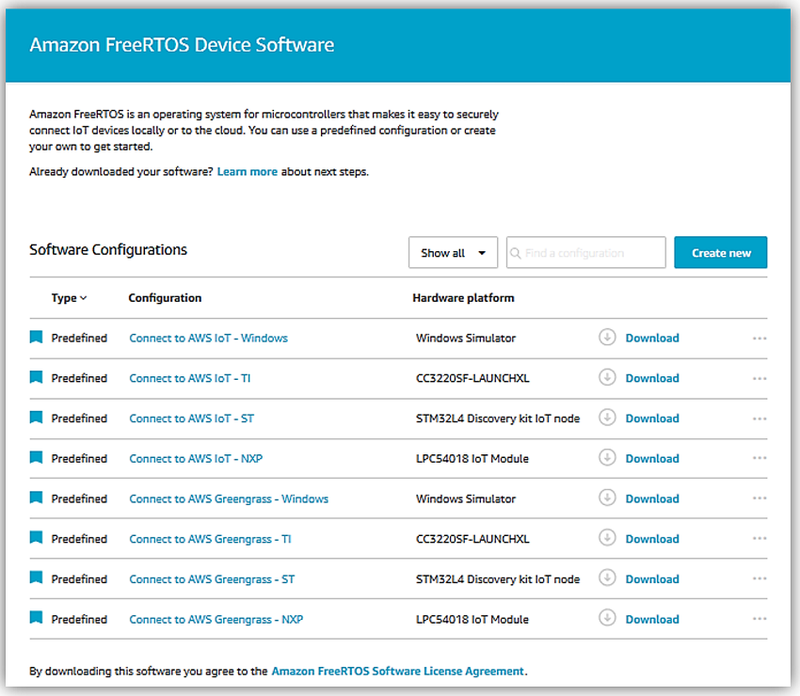 The Amazon FreeRTOS console allows you to select and download the software that you need for your solution. There is a Qualification Program that helps to assure you that the microcontroller you choose will run consistently across several hardware options. Finally, Amazon FreeRTOS kernel is an open-source FreeRTOS operating system that is freely available on GitHub for download. But I couldn’t leave you without at least showing you a few snapshots of the Amazon FreeRTOS Console. Within the Amazon FreeRTOS Console, I can select a predefined software configuration that I would like to use. 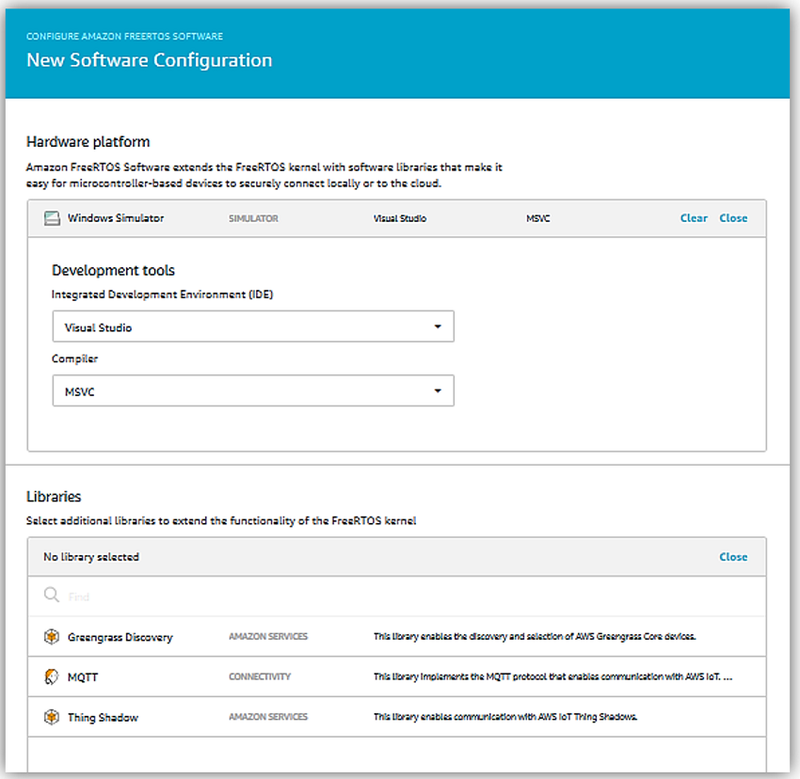 If I want to have a more customized software configuration, Amazon FreeRTOS allows you to customize a solution that is targeted for your use by adding or removing libraries. Thanks for checking out the new Amazon FreeRTOS offering. To learn more go to the Amazon FreeRTOS product page or review the information provided about this exciting IoT device targeted operating system in the AWS documentation. Can’t wait to see what great new IoT systems are will be enabled and created with it! Happy Coding.